It's a good idea to wait and turn your Emissary quests in after the latest content update goes live tomorrow, and here's why. Artifact Knowledge catchup will be enabled again tomorrow and the amount of Artifact Power needed to level up your Heart of Azeroth will gradually decrease starting the week of January 22. Talanji's Expedition Emissary rewards 1,000 Artifact Power. Tomorrow, the amount of XP needed to level up your Heart of Azeroth will decrease, resulting in more Experience for the neckpiece. Update: We received the same reward as yesterday, an ilvl 355 Azerite piece after reset. Item level of Azerite gear rewards from Emissaries will be increased in Season 2. Hold off turning in the quest for a chance to receive Season 2 Azerite gear with the new outer ring. The Zandalari Empire Emissary rewards an Azerite Armor Cache today on US realms. 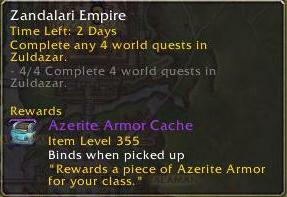 Tomorrow, Azerite gear acquired from Emissary World Quests will have an increased item level and you will have a chance to receive new Azerite gear with the new outer ring, so don't turn the quest in just yet! If you're playing in the EU region, you should hold off turning in your World Quest Emissaries until Wednesday, unless they reward Gold. Mythic+ rewards are capped at ilvl 385 until Mythic Battle of Dazar'alor opens. If you complete a Mythic 10 run the week of January 29, however, rewards from Grand Challenger's Bounty will scale up to 410 the following week. "....during the first week of Season 2, rewards from end-of-run chests will be capped at Mythic 6 quality (item level 385)"
Does that mean if you do a m+ above 6 you will get a 385 ilvl piece and it still can titanforge to 400 for example?